Stanwood is a city of under 6,500 residents in Snohomish County, Washington. It is the “gateway” to Camano Island in the Puget Sound and is on the border of both Island County, to the west, and Skagit County to the north. The city is located 13 miles south of Mt. Vernon (in Skagit County), and 20 miles north of Marysville. Stanwood is a growing, rural community. Whether older or newer, homes for sale in the area tend to be on the waterfront, acreage or both. 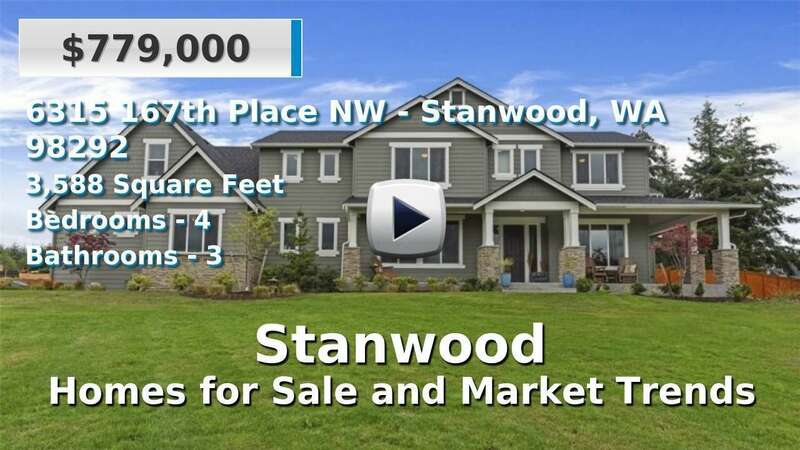 Many people choose to live in Stanwood for its small town feel and easy commute to the Everett-Marysville area. 4 Beds | 3.25 Baths | 2560 sq. Ft.
1 Beds | 1.25 Baths | 560 sq. Ft.
3 Beds | 2.5 Baths | 1931 sq. Ft.
3 Beds | 1.75 Baths | 1356 sq. Ft.
3 Beds | 1.75 Baths | 1264 sq. Ft.
3 Beds | 4 Baths | 3147 sq. Ft.